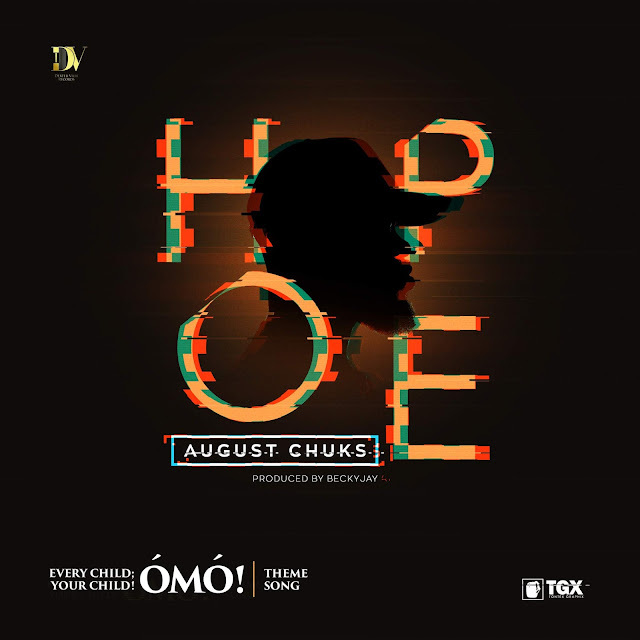 Award Winning Artiste, August Chuks, set to drop theme song for the Daily Trust Most Anticipated Book of 2018. 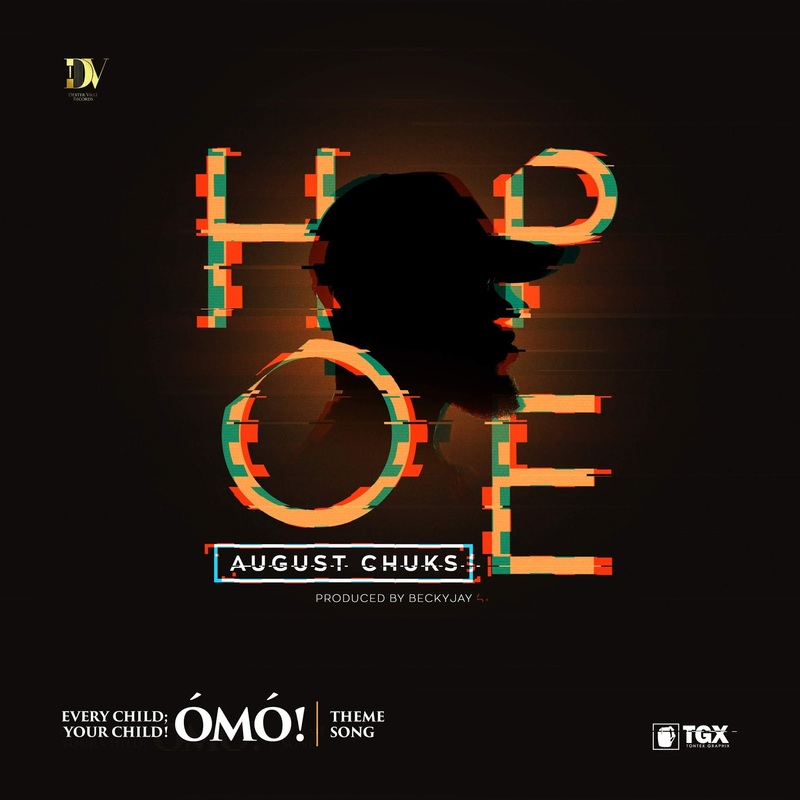 Hope is the theme song for Omo, the Daily Trust Newspaper Most Anticipated Book of 2018. 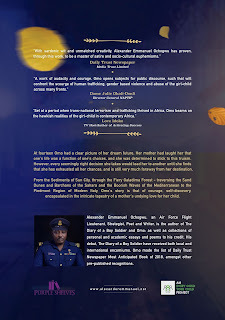 The song is in sync with the theme of the action thriller novel by Flight Lieutenant Alexander Emmanuel, who has said he was dedicating the song and the book to Leah Sharibu, who is still in captivity since her abduction from Government Girls Science and Technical College, Dapchi on 19 February 2018, and every African child who is snared by discrimination and abuse. "The message of Omo is an inspiration that transcends the letters inside this book (pointing at the book), that is why we have chosen to use every medium available to us to transmit this message of hope. With hope and sincere love, I believe every pain and suffering people go through will become past some day, and love will cause them to heal again." 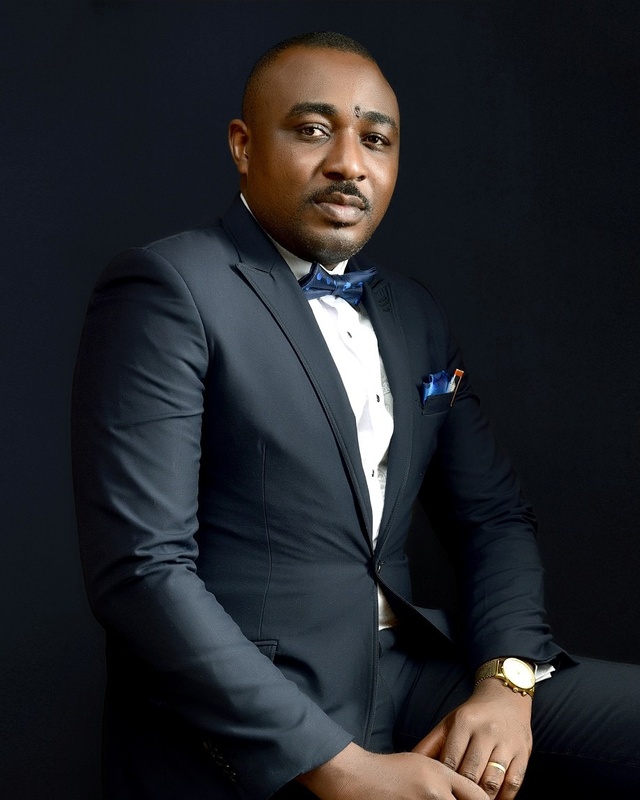 The author who recently had an engagement with distinguished Hon. Omosede Igbinedion, member, representing Ovia South/West-Ovia North/East Constituency of Edo state, expressed his passion for the cause of the girl child and how to synchronise the vision of his book, Omo, with her recent motion on the establishment of stricter laws for Child Molestation and Abuse in Nigeria. 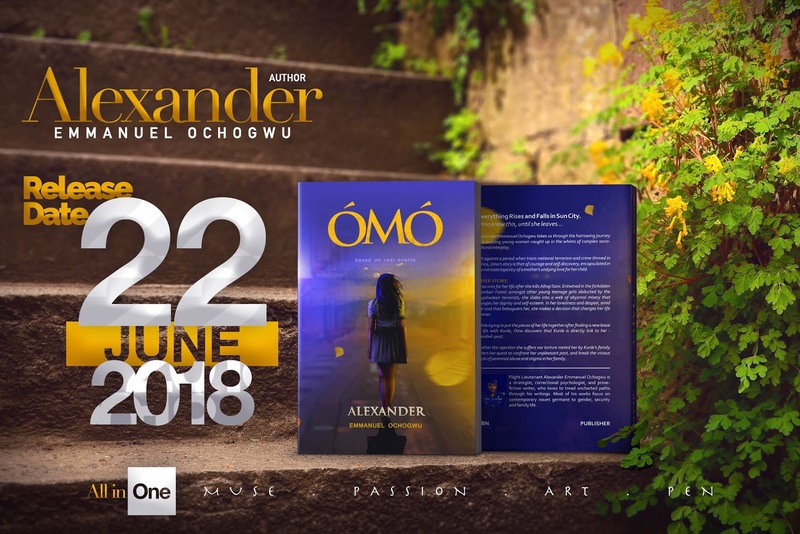 Published by Lagos based publisher, Purple Shelves, Omo will be due for release on 22 June 18. 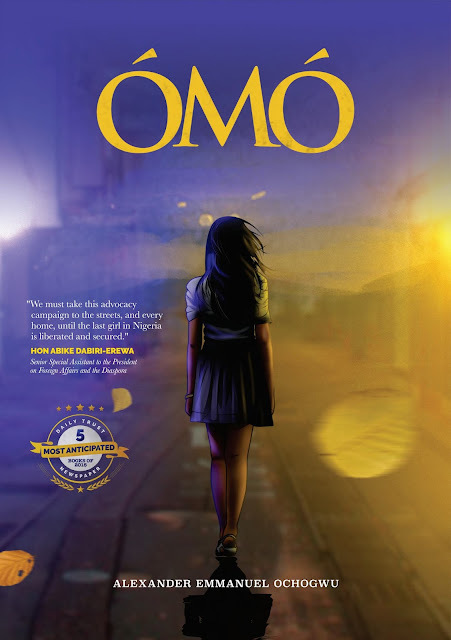 Omo is the compelling story of a young Nigerian girl and the contending realities along her journey of self-determination. Growing up in Sun City, a ghetto suburb in Lagos, Nigeria, brought Omo face to face to the life lesson of surviving independently. As daughter to a negligent father and a die-hard mother, she knew she had to find a way of living her dream of winning a National Science Competition she entered for. It was in this quest she got enmeshed inside a downward spiral that sent her into the abysmal misery that changed her life; and to retrace her steps, she would have to travel 6 years and 6,000 miles back to where she may have missed it, just to correct one mistake. 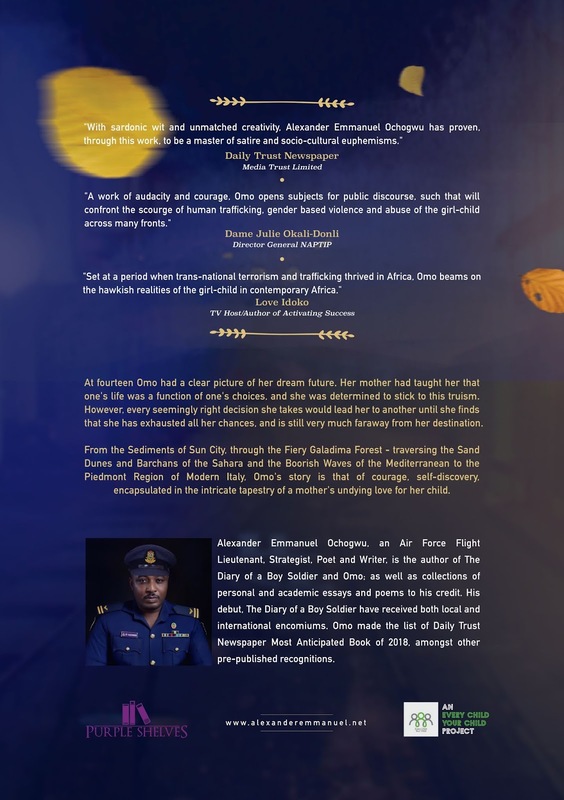 From the Sediments of Sun City, through the Fiery Galadima Forest - traversing the Sand Dunes and Barchans of the Sahara and the Boorish Waves of the Mediterranean to the Piedmont Region of Modern Italy, Omo's story is that of courage, self-discovery, encapsulated in the intricate tapestry of a mother's undying love for her child. Alexander Emmanuel Ochogwu, an Air Force Flight Lieutenant, Strategist, Poet and Writer, is the author of The Diary of a Boy Soldier and Omo; as well as collections of personal and academic essays and poems to his credit. His debut, The Diary of a Boy Soldier have received both local and international encomiums. 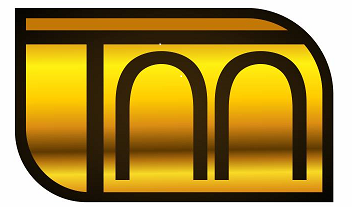 Omo made the list of Daily Trust Newspaper Most Anticipated Book of 2018, amongst other pre-publishing recognitions. Osakwe August Chukwuma popularly known as (August Chuks) is a delta state born and port harcourt based alternative musician currently working under dexterville records. 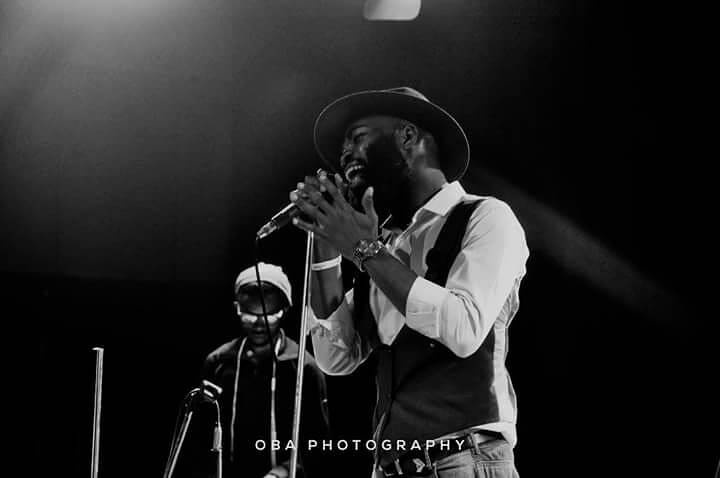 An award winning recording artiste, his bias for literature and expressive lyrical content inspired the hit singles such as LET ME and REDEMPTION. 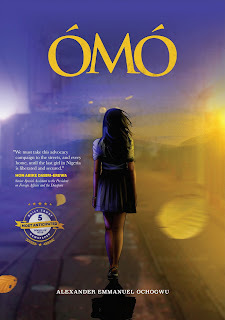 "Set at a period when trans-national terrorism and trafficking thrived in Africa, Omo beams on the hawkish realities of the girl-child in contemporary Africa." "We Must take this advocacy campaign to the streets, and every home, until the last girl in Nigeria is liberated and secured." "A work of audacity and courage, Omo opens subjects for public discourse, such that will confront the scourge of human trafficking, gender based violence and abuse of the girl child across many fronts." 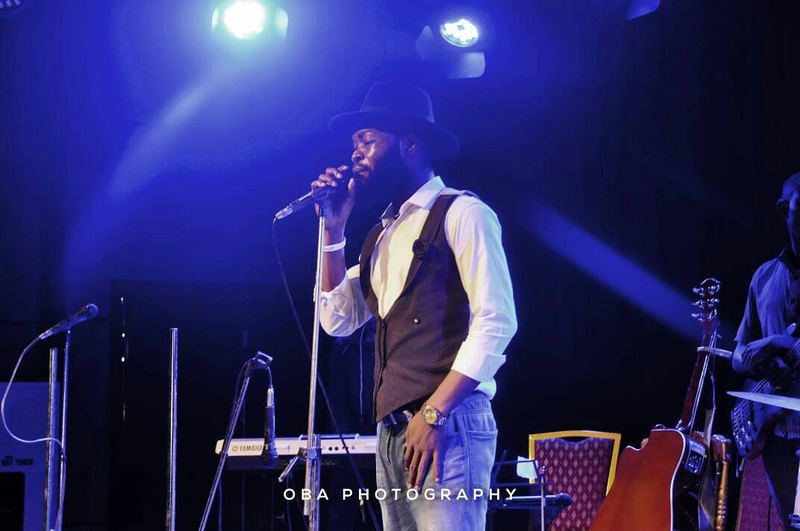 "With sardonic wit and unmatched creativity, Alexander Emmanuel Ochogwu has proven, through this work, to be a master of satire and socio-cultural euphemisms." "Three steps brought her to the edge of a burrow covered with bushes, and she bent to peer at the pit. The noise from the pitch darkness started as the howling of two wild birds with distinctive voices, followed by the chirping of birds and croaking of frogs, and soon became a motley of cacophonies. An owl flew past and returned to perch on the branch of the huge tree above Omo's head. It paced along the sprouting branch with its crusty claws, a couple of times, and stopped. When Omo looked at the bird for a second time, it was upside down, watching her every move. She made way to a dark space inside some low bushes, avoiding the creature's boorish gaze, and another shade of darkness enveloped the column where she squatted after the last sliver of the moon's grey face sunk into the cloud." "Neighs and rumbling outcry ushered Hippocampi and his army of five thousand wild horses; and like war against Palaemon and Leucothea, they pranced upon the tumultuous waves, stamping hooves on the lily-livered. The battle lord left with more than two hundred souls and was returning for a mop up when the Mediterranean mounted its full glory. Poseidon cast its final spell on the waters, and the sea roared. Fresh towering waves primed by a North Easterly Wind arose, brandishing fuming faces over the hapless seafarers beneath their breath, and overlooking their prey: whereas clamours of gritting teeth, stillness of frozen bodies, despair of hopelessness, and the hurls of last-minute regrets coloured the Mediterranean, crimson red." "Results for the qualifying tests to compete at the Biennial National Science Competition for secondary schools in Nigeria had just been released and the picture of the events just after they finished singing All Things Bright and Beautiful at morning assembly was still fresh in her head. “Omonigho Aliyu.” Mrs Olanipekun called out from the podium. When the principal called out your name at assembly, it was either to punish you or –rarely – to commend you for an excellent deed. She broke out from her friends, who seemed indifferent about her fate, to trudge through the recalcitrant crowd. Two senior students kicked her ankle, while the boy in SS 2, who rarely attended classes, wedged his leg along her path, but she jumped over the trap and stooped to beat the taut chain Senior Bunmi and Senior Chidinma formed with their hands to obstruct her passage through their ranks. “I don warn you make you no dey pass my class line, abi?” Senior Bunmi scowled." "She woke up in an open field, wearing a robe that shone like a cherubim’s and feeling no pain. A still voice, which sounded like that of an angel as was described during her Sunday School's lessons, whispered to her curious mind that there was no limit to how far she could soar along this lonely path where pain and sorrow were buried deep down in unconsciousness. She spread her arms in flight, mounted for a lift, and levitated through the blue foamy clouds to ride against the wind when she steadied her arms. Heaven is real. Moments into the arms of the sultry cloud, she pitched by a flowery garden where the air smelt of petrichor and a pandemonium of parrots patronized prides of peacocks parading in purple plumes across the serene flora nature crafted so beautifully. If only life could be this way, she thought, relishing her moments in this ethereal ambience."